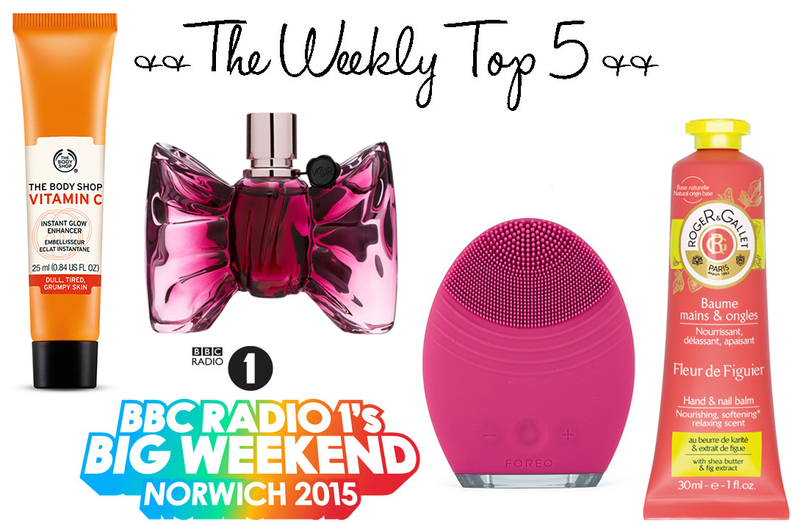 Radio One’s Big Weekend – Of course! I’d been looking forward to this ever since it was first announced, and when I managed to get hold of a pair of Saturday tickets I was over the moon! Unfortunately we got stuck in traffic and missed the first couple of acts, one being Snoop Dogg who I’m told was amazing. I also heard on the grapevine that he was a complete diva with his demands at the hotel he was staying at in Norwich, how funny! Anyway the weather was perfect – warm but not too hot and I was so excited to finally see two of my favourite bands, Years and Years and Rudimental. We really had the best day and even though I wasn’t drinking I actually feel like I’m hung over today because I’m so tired and full of cold! Victor & Rolf Bon Bon Fragrance – I bought this in a blog sale about a month or so ago and I’ve just got round to using it. Bon Bon has the sweetest prettiest scent, it’s very girly with top notes of mandarin, orange and peach, heart notes of caramel, jasmine and orange blossom, and base notes of cedarwood, guaiac wood, sandalwood and amber. It’s the perfect summer evening fragrance. Roger & Gallet Fleur de Figuier Hand & Nail Balm (£6.00) – Admittedly I’m not usually one for hand cream, as I don’t suffer with dry hands or have any other hand issues that might need cream, but I have found myself reaching for this Hand & Nail Balm this week just because it smells beautiful and makes my hands feel soft and supple and just nice! This balm contains shea butter, aloe vera and fig extract, to nourish and protect dry hands, whilst offering long lasting hydration and a mattifying finish on the skin. Foreo Luna For All Skin Types (£149) – I’ve only just started using the Luna For All Skin Types so I won’t go into too much detail as I’ll be writing up a full review shortly. The Foreo Luna is a soft silicone brush that deeply cleanses skin whilst reducing signs of ageing, it uses T-Sonic technology to thoroughly cleanse by channelling sonic pulsations across the skin’s surface to unblock pores and remove impurities. It’s completely water proof, easy to clean, and rechargeable. So far I’m really impressed with this product but keep you eye out for my full review coming soon. The Body Shop Vitamin C Instant Glow Enhancer (£14.00) – I’m instantly attracted to any product that promises to make my complexion ‘glow’ be more ‘radiant’ or more ‘healthy’ – seriously if I see any of these buzz words on a product I’ll want to try it!! The Body Shop’s Instant Glow Enhancer is basically a tinted moisturiser in their Vitamin C group of products. It’s perfect for giving a hint of glow to the complexion – I have very fair skin and it just makes me look a bit healthier and more alive! It’s also a great multi tasker that can be used on it’s own for a natural look or under foundation as a primer. Lovely collection and I really like that perfume bottle, super sweet!